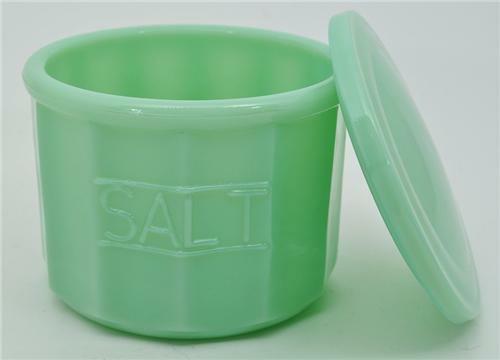 From our Summer Inventory is this very nice new Jadite Lidded Glass Salt Container. The color and markings are very nice on the piece with the salt wording very distinct and clear. I have put this in the Fire King Category as this is where these items are searched. This is a very well made reproduction piece, not an original vintage Salt Container. This is a great item to add to the Jadite or Vintage Kitchen Collection or decor.....and a Great Price!